Whether sported atop a magnificent buck in rut, or as the perfect complement to a cozy cabin, you have probably been awed at an iconic anatomic feature uniting an entire family of beloved mammals – antlers! What you may not have appreciated is that antlers from an individual cervid need not be identical, and this asymmetry may be an indication of environmental stress, physical ailments, or even a defect with your prize buck’s manhood! Antlers are a commonality among the mammalian family Cervidae, and are largely only grown by the males of a species. There are exceptions to this rule, such as female caribou which do grow antlers. Males use these impressive structures to compete directly with other males for female attention via physical combat, as well as compete indirectly by displaying their superior physical condition to admiring females. With the growth potential of two centimeters every 24 hours, antlers are one of the fastest growing mammalian tissues. Unlike horns, antlers are shed every year. This loss and re-growth can provide valuable insight into the health and stress an individual has experienced – a helpful hint for both hunters, and wildlife health workers such as those in the BC Wildlife Health Program. The growth and appearance of antlers are influenced by a variety of health factors: parasites, nutrition, congenital causes, and more. This past week we saw such a case. An adult male black-tailed deer was found, unable to rise in a yard in Duncan, BC. On postmortem examination there were a number of potential explanations for why he stumbled into the yard and collapsed. Tissues were submitted to the BC Animal Health Centre to understand those reasons; however, the antlers were unusual as well. The right antler was two points and the left was 4 points and semi-palmate (partially flattened like that of a moose). With antler asymmetry it is important to examine the gonads. It turned out that the buck had one testicle which had not descended into the scrotum – a condition known as “cryptorchidism”. The production of testosterone in the testicle is very temperature sensitive, so its normal location in the scrotum allows a lower temperature. If a testicle is retained inside the body it is at a higher temperature and we suggest that, in this case, the testicles’ ability to both respond to, and produce hormones for antler growth was altered. Hormones such as testosterone are necessary for antler development, playing roles in antler growth and velvet shedding. 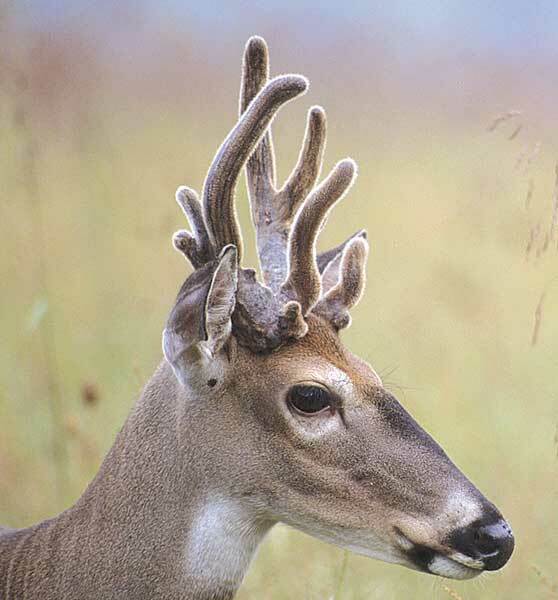 By changing the level of testosterone production, a cervid may show a variety of problems with antlers, including asymmetry, abnormal shape, retained velvet, or retained hard antler. Hopefully, the next time you see a lopsided cervid you will remember this and have sympathy for asymmetry. After all, beauty is only skin deep, but a retained testicle goes much deeper. Next story Who put the dead crow in the freezer?